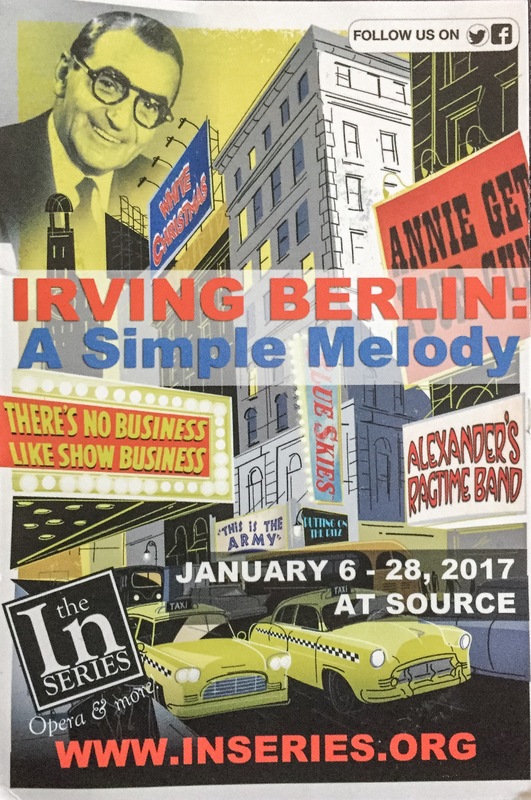 We were able to attend the last night of Irving Berlin: A Simple Melody, last night at the Source Theatre. The tribute in song included 38 of the over 1000 songs Berlin wrote during his storied career. Some of the toe-tapping favorites included Alexander’s Ragtime Band, I’ve Got My Love to Keep Me Warm, How Deep Is the Ocean, A Couple of Swells, Puttin’ on the Ritz, Supper Time, Anything You Can Do, Love You Didn’t Do Right By Me, The Best Things Happen While You’re Dancing and There’s No Business Like Show Business. It was a great evening with a number of standout out selections. The most moving piece of the evening was Supper Time. By today’s standards, Supper Time would be considered a protest song. It speaks to the suffering and struggle of an African American woman dealing with the loss of her husband to lynching. Kryslynn Perry’s delivery was one of the most moving of the evening. Jaely Chamberlain’s performance of Love, You Didn’t Do Right by Me, was also a standout. For more information on shoes at The In Series, visit www.inseries.org.